Bring half of the heavy cream with half of the sugar and vanilla seeds to a boil. Remove pan from stove. Next, add other half of chilled heavy cream and the softened gelatin. Mix until the gelatin has dissolved. Fill the ramekins with the mixture, cover well and chill for at least 4 hours, or overnight. For the fruit sauce, slice passion fruits open and remove the flesh using a spoon. Put into a small sauce pan. Add remaining half of sugar to the passion fruits and bring everything to a boil. Remove the saucepan from the stove and puree the sauce, so that the flesh separates and the seeds remain whole. 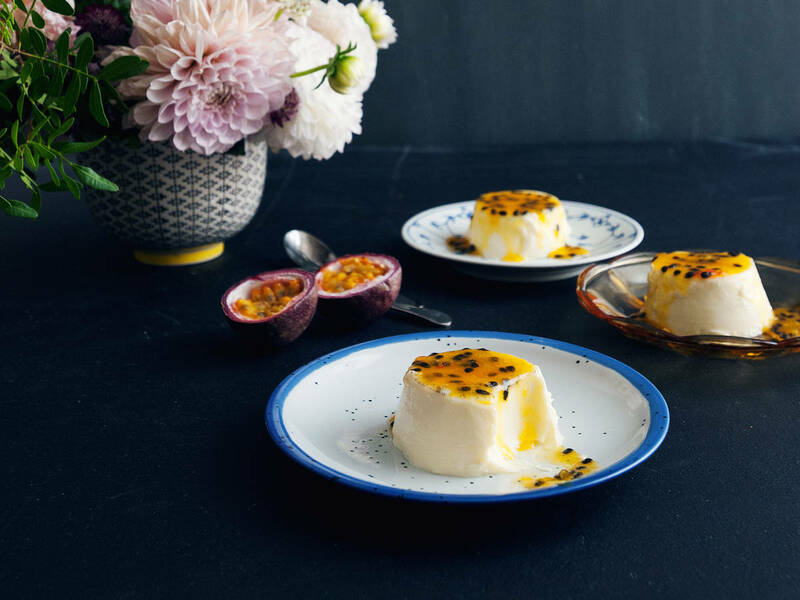 To serve, remove the Panna Cotta from the ramekins and drizzle passion fruit sauce on top.